When one thinks of Florida, probably the first thing that comes to mind is Florida's beaches. With approximately 1,200 miles of coastline, the Sunshine State certainly has plenty of them. But, if you put beaches and camping in the same sentence, then you're going to be disappointed to learn there are only a handful of campgrounds that are located right on the beach. While there are many "waterfront" campgrounds in Florida — some even have nice sandy beaches — most are located on lakes and rivers. There are not many with campsites situated directly on the Atlantic Ocean or the Gulf of Mexico. Of course, you pay for the privilege of having nothing between your rig and the water but a patch of sand. While the $65 to $150 or more per night for a beachfront campsite may seem extreme, this is one of those experiences that would make a great MasterCard ad. Camping on the ocean, $150. Experiencing gentle sea breezes, swaying palms, seagulls squawking overhead the sound of waves lapping at the sandy shore... priceless. A little less expensive, but still often worth the experience are the campgrounds located "near" the beach — often across the street from the beach. That means you usually have to walk several yards and sometimes cross a busy highway to get to the beach. Campgrounds located on Intracoastal waterways — bays and sounds — are an affordable alternative as well. Often camping experiences don't live up to expectations. While camping on a Florida beach sounds like a wonderful experience (and generally it is) there are situations that may not make it a pleasant experience for some. Don't Expect Spacious Campsites: These campgrounds are packing campers in... literally. Expect room for your rig; and, if you're lucky, you will be able to extend your slide-outs and awning. We have seen some sites so tight that awnings overlap. If you don't like to camp very close to your neighbor, you will likely not like this camping experience. Sewer Hookups Are Not Available: In the absence of sewer hookups though, some campgrounds offer a "pump-out" service for an additional charge of $7 to $10. This is a great idea and definitely worth the charge. There is No Shade: They don't call this the Sunshine State for nothing. Expect there to be sun and expect it to be hot. No Pets Are Allowed: Campgrounds and campsites located on the land-side of the beach often are pet-friendly, so check with your campground when you make reservations. Sand is Plentiful: Expect it in your rig or tent, expect it in your clothes and bed and maybe even your food. Obviously, if you're going to camp on or near the beach, you are expecting to visit the beach. These beach packing tips include items you should add to your camping checklist. Learn how to survive summer camping in Florida. You definitely need these tips on how to beat the Florida heat. Pay particular attention to packing your cooler and expect to use more ice than you ever have before! Bugs may be more plentiful near the beach. What's Bugging Florida will give you an insight as to what you might expect and some remedies. Beverly Beach Camptown: This Atlantic Ocean-front campground is just 30 miles north of Daytona Beach and 25 miles south of St. Augustine. Oceanfront rates are seasonally adjusted and also depend on the day of the week. Oceanview rates* are slightly less with tent rates the cheapest. Monthly rates are available. 2816 N. Oceanside Boulevard (A1A), Flagler Beach. Call 800-255-2706 for reservations. Campers Inn: Across the street from the white-sand beach with beach access. Tent sites available. Rates not published. 8800 Thomas Drive, Panama City Beach. Call 866-872-2267 for reservations. Camping on the Gulf: A wide white sand beach leads to the Gulf of Mexico and is just steps away from your campsite. Beachfront campsites are 20-feet wide. Beachfront rates during the summer high season run higher and there is a premium on holidays (a three-night minimum stay is required during holiday weekends). Offseason is slightly less. 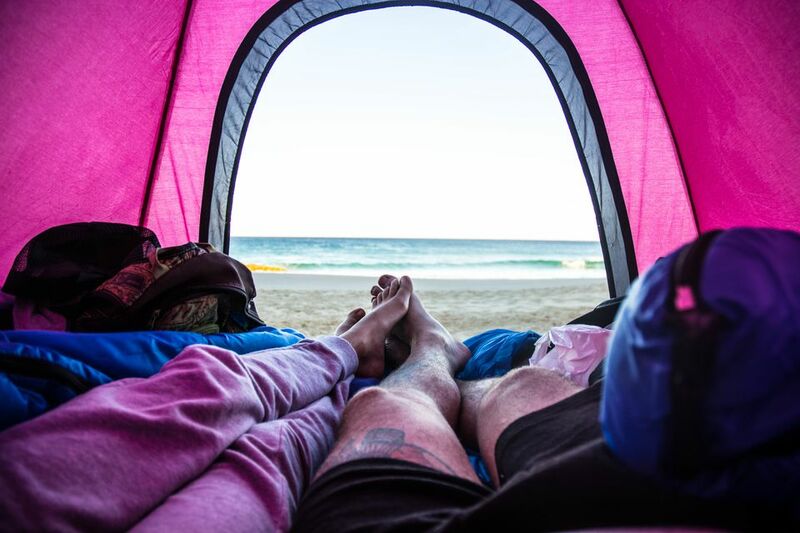 Tents are allowed in off-beach campsites only. 10005 Emerald Coast Parkway, Destin. Call 877-226-7485 or book online for reservations up to one year in advance. Carrabelle Beach RV Resort: Own your own RV site or rent one at this modern campground directly across the highway from the beach. 1843 Highway 98 West Carrabelle. Call 850-697-2638. Emerald Beach RV Park: This pet-friendly park is located on Santa Rosa Sound (also known as the Intracoastal Waterway) and has a very limited number of beachfront sites. While it isn't directly on the Gulf of Mexico, it is as close as you can get. Rates* vary depending on the time of the year. 8885 Navarre Parkway, Navarre. Also, weekly and monthly rates are available. Call 850-939-3431 or toll-free 866-939-3431. Ho-Hum RV Park: Back up your rig to the Gulf of Mexico and enjoy the sea breezes. The beach is very narrow and activities are limited, but great for shelling and bird watching. Rates* are very reasonably priced for beachfront. Weekly and monthly rates available. 2132 US 98, East Carrabelle. Phone 850-697-3926. Juno Beach RV Resort: Just across US 1 and A1A to Juno Ocean Park and the beach. Rates vary according to section and season. 900 Juno Ocean Walk, Juno Beach. Phone 561-622-7500. North Beach Camp Resort: Located on a barrier island between North River and the Atlantic Ocean with an oceanfront deck facing the Atlantic. 4125 Coastal Highway (A1A), St. Augustine. Phone 904-824-1806 or toll-free 800-542-8316. Ocean Grove RV Resort: Located on scenic Anastasia Island located directly on the Intracoastal Waterway, but the Atlantic Ocean is just 300 yards away across A1A. Campsite rates* depend on the day of the week and time of the year. Weekly, monthly and annual rates are available. Call toll free 800-342-4007. Old Pavilion RV Park: Reserve your own slice of sand and back your RV right up to the Gulf of Mexico. Daily, weekly, monthly and annual rates are available. 20771 Keaton Beach Drive (Keaton Beach), Perry. Call 850-578-2484 for reservations. Perdido Cove RV Resort & Marina: Situated on the Intercoastal Waterway, some RV campsites overlook the water and marina. Rates* are dependent on campsite location and season. 13770 River Road, Perdido Key, Pensacola. Call 850-492-7304 for reservations. Red Coconut RV Park: Located on Fort Myers' Estero Island with the Gulf of Mexico at your doorstep. Rates* are seasonally adjusted, plus a charge for utilities. 3001 Estero Boulevard, Ft. Myers Beach. For reservations call 888-262-6226 x204 or book online. Turtle Beach Campground (formerly Gulf Beach Travel Trailer Park): This Sarasota County park, located on Siesta Key between the Gulf of Mexico and Sarasota Bay allows you to park near the Gulf and just steps from the beach. Rates are not published. 8862 Midnight Pass Road, Sarasota.